Do you have any of those dishes? You know the ones. You make them once a year, every year, like clockwork? And you're not quite sure why you only make them just once...but you accept it. And you enjoy it. Well, I do happen to have a few dishes like that...and this Fresh Coconut Tart just so happens to be one of them. It is always Springtime when I make it...um, perhaps that is because coconuts happen to be in season during this time in Northwestern Indiana. Aaaahhhh, no. It's probably just that the first time I made it was in Spring, and since it became a yearly thing, I wound up making it at about the same time from there on out. I (and other members of the fam) have just come to associate it with Spring. You know what the funny thing is? This is actually a recipe rewind. This will be the first time I have ever shared a recipe two times here at girlichef. But I thought that would be okay because I'm way more experienced at blogging now than I was when I shared it a little over two years ago. We had just moved into our new home, I had my old camera, I knew less about how to take a good photo...shall I continue? The one thing I will say, is that back then, I did all sorts of step-by-step posts...and that was one of them. So, if you'd like to see how to open the coconut and get the meat out, you could go back and check out the first post. Although, I also demonstrate the method when I made fresh coconut milk...and those shots are a little more current (I recommend this post for method of getting the coconut water out of the coconut and the meat from the shell). The best thing about making something for so many years like clockwork is that you develop methods for making your life a little easier. Shortcuts, favorite ingredients and methods that differ from where you first started but still give you the same results. 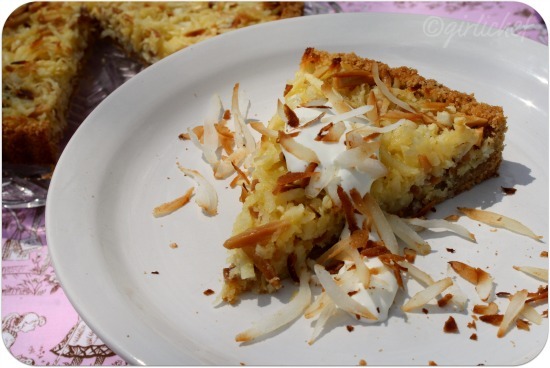 When picking a coconut to make this tart, I look for the one with the most coconut water inside. People may think I'm nuts, picking up each individual coconut and giving it a shake, but if they tried this tart, they'd nod their heads in understanding. The more the better so that you can make a really flavorful, concentrated homemade sweetened condensed coconut milk. Which, I might add, is totally worth making for other purposes, as well. So good. Another thing I've decided over the years is that my favorite bread to use for the crust is Pan de Acambaro, which is a Mexican Sweet Bread from Guanajuato that tastes a lot lot Pan de Muerto...which you could also use (but if you do...be sure to use an unglazed loaf without sesame seeds or any fillings). Challah would be a good option, as well. Although, that said, I have also made this with a simple French or Italian loaf...basically you want a plain, sturdy loaf that holds up well. And perhaps last, but not least, I toast my almonds and coconut on the stove top, in a skillet instead of doing it in the oven. I don't know if I'm actually saving myself time here, but it seems like it to me. Whichever method you decide to use will give you great results. Combine toasted almonds and sugar in a food processor and process until fairly fine. Add bread, ripped into hunks and pulse until you have fine crumbs. Slowly drizzle in the butter and pulse until everything comes together. 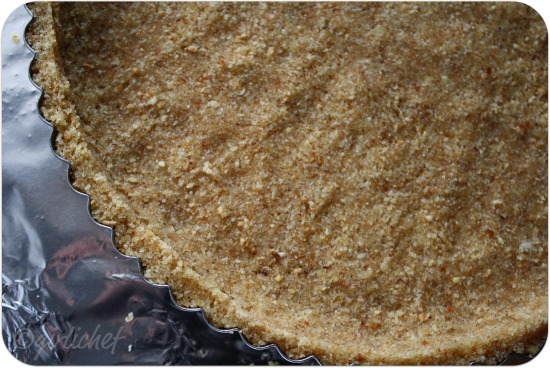 Place a 9" tart pan with a removable bottom onto a foil-lined baking sheet and dump the mixture into it. Press the mixture evenly and firmly over the bottom and up the sides of the pan. Transfer to the refrigerator. I like to leave this in the fridge for at least 30 minutes. Let's begin with the trickiest part, which is getting all of the good stuff out of that hard coconut shell. Preheat the oven to 325° F. Set a strainer over a bowl. Pierce the eyes of the coconut...I like twisting a corkscrew through each...and let all of the liquid drain into the bowl, through the strainer. Once you've gotten all the liquid out of the coconut, place it on a baking sheet and put it into the preheated oven for ~15 minutes. This helps to loosen the meat from the shell. Remove from oven and once cool enough to handle (a few minutes), break the coconut in half. I either hand it off to Mexi to whack once with a machete, or else I hammer a flat-head screw driver into the middle in a few spot until it splits. Pry the flesh from the shell, then use a vegetable peeler of a paring knife to remove the brown layer from the meat. Feed through coconut meat through the shredding attachment of the food processor. Measure out 2½ cups for the tart, and save the rest to use as garnish. Turn the oven up to 350° F. Combine coconut water, cream, and sugar in a medium saucepan (seriously, go larger rather than smaller to prevent boil-overs). Simmer over medium heat, stirring from time to time, until reduced to 1 cup, ~10-15 minutes. You know you're gonna want to dip a finger in...I can't resist...sweetened condensed coconut milk* is the best thing since...well...sweetened condensed regular milk. Anyhoo...pour that into a large bowl and stir in the reserved coconut, toasted almonds, vanilla and egg yolks. Remove the crust from the fridge and pour the filling in. Bake until set and golden on top, ~35-40 minutes. Set on a wire rack to cool, then pop out of the tart pan. Toast the remaining coconut, if you like and use it as garnish along with some Mexican Crema (which helps to cut the sweet with a bit of creamy-sour) or créme fraîche. This tart refrigerates well...simply wrap some plastic wrap around it. I prefer it warm, though...so a microwave for just a few seconds (so it doesn't get soggy) or a preheated oven for ~5 minutes does wonders to take off the chill. *yup, Sweetened Condensed Coconut Milk is what you have at this point...you can make it and use it in place of Sweetened Condensed Milk in other recipes! I completely get why this is a return winner! I don't think I've ever seen a crust recipe quite like this one..it has me curious for sure. I love all the texture with coconut desserts like this. You get the smooth and creamy and then the crunchy crust and the flaky coconut. Love it! I wonder how Hawaiian bread would work in this crust. This sound delishious!!! This reminds me of our family trips to Miami Beach every year to visit my Uncle. We'd always bring back a coconut that had fallen from one of the trees in his yard then spend a whole afternoon trying to crack it open (hard cement driveway and screwdriver). I love fresh coconut but I haven't opened one in years. Will try your method and definitely try this winning tart! I am reading the comment above and I am thinking we used to pull coconuts out of the water all the time too- Guess where? Miami Beach! Love the coconut tart-a very summer like dessert. wow... takes me back to my island days. There was a great little family owned shack restaurant that served two desserts... something very similar looking to this and Rum (straight shots). Wow. Now THAT looks good! I will definitely be trying this. Thanks! just by the looks of it...it is already a winner to me, too! Thanks for sharing it with us this week. this time of year coconut is the best. it just tastes like warm weather! 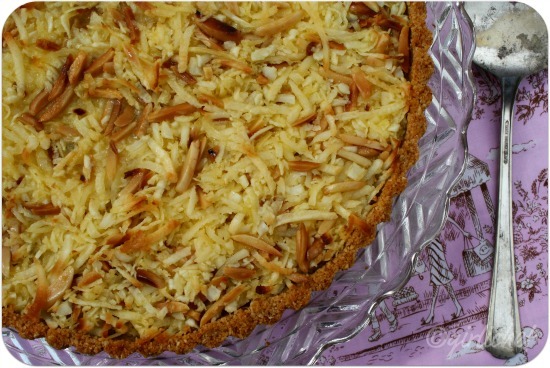 i love those toasty shreds of coconut with almonds, gorgeous! It's definitely uncanny how on occasion I look back to posts from last year and find that I cooked very similar things within the same month! Must be some weird seasonal craving thing. What a gorgeous tart! I LOVE that it has fresh coconut! Hi there!! I follow you on Twitter...but don't know how I've never made it over to your blog! Love it here, and am now your newest follower. I followed over from your comment on Nutmeg Nanny's post about the coconut oil. When I read your comment about olive oil, bacon fat, and lard...I knew we were "kindred spirits!" I love the taste combinations in this coconut tart. I love coconut & I love nut based crusts. Much better for us than using so much flour. I'll be back often. Have a GREAT weekend!! Oh fresh coconuts.... Yummy! Coconut water is diving I must add. What I don't understand is why you only make this once a year?! It looks great! I would love a piece of this right now....please! Love the coconut and almond combination! It reminds me of one of my favorite candy bars. 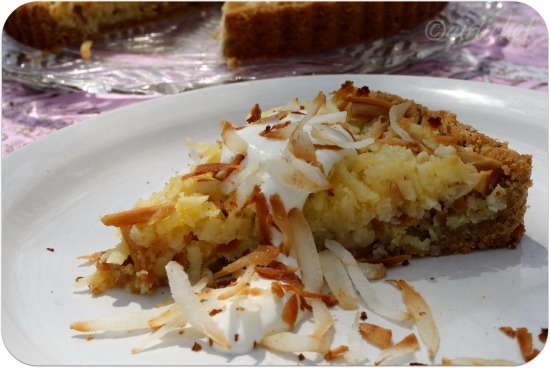 I haven't used fresh coconut in ages and can imagine how tasty it is in your beautiful tart. I love recipe rewinds because those are often some of the best reacipes and we forget about them because they were posted so long ago. My once a year recipe is chocolate zucchini cake- so good! This looks awesome Heather and now I'm going to crave coconut til I get some! This is definitely something I would enjoy! Thanks for linking this up to Fat Camp Fridays this week! See you next week! I love anything that has coconut this one looks delish! Oh my this tart looks lovely. we've got fresh coconuts here all year long, but haven't seen it being prepared your way! would love to try that!!!! An excellent tart, love the almond crust, so good! Have a terrific Mother's day! Quick run to the phone BBFF and call FedEx to shop me a slice, if you have any left. Better yet shop yourself too and we can cook together. It looks fantastic! I'm drooling big time and need to make this because coconut is the perfect food in my book! Love anything with coconut, most weakness towards them. This tart looks fabulous. Came over from Saturday Swap. Your coconut tart looks so yummy! I love coconut desserts and this one sounds amazing. I have never purchased a fresh coconut before. I will have to check out your post on opening a coconut and give this a try! I'm crazy about anything with coconut! That looks positively delish! It is perfect for Spring & I definitely see why it is a favorite:) Thanks for sharing! I'm not a big coconut fan -- but this looks worth a try! Delicious! It's funny now that you mentioned it, I also make things around the same time of the year, for no particular reason! i should make this for my mom for mother's day...she LOVES coconut and i know she would swoon over this. i'm keeping my finger's crossed that i can find some time to make this because i am craving it now. I'm so glad you posted this, because I didn't know you way back when! I'm a coconut lover, and like you, I think of coconuts in the springtime. I can't explain it either, but my mind turns to macaroons and other yummy coconut delights. This tart is gorgeous! Definitely saving this one! Very addictive and fabulous tart.. I also have these once a year recipes, and you know what I find so great about it, I almost forget how good they taste, it is like trying a new thing again. And, I ve watched the movie already, alone and eating ice cream, :) Ill send you my entry as soon as I post it. That pie looks delicious - I'm not so keen on the almonds in the crust, but I think it would still be nice with a generic sweet pastry. You've got a lot of great recipes on this blog! This looks so beautiful with the toasted coconut. I bet it is delicious!! I don't want to delete posts but this is kind of a scratch my back Ill scratch yours sort of thing..
looks really delicious and thanks for sharing the recipe! have a great weekend! There are so many parts of this recipe that blow my mind - I've never used breadcrumbs for a tart shell before, I've never opened a coconut. This looks so amazing and I just have to try it! Coconut in tarts! Sounds and look exotic dessert. Lovely click, H.
Wonderful recipe and that look so yummy.